When you hear the name Tyndale what comes to mind? For me it is the Bible in English. More specifically the King James Version (Authorized Version). Before William Tyndale was murdered for his work he translated the entire Old Testament and half of the New Testament into English from the Greek and Hebrew original texts. When his Bibles (pocket sized) were smuggled into England they were soon taken and destroyed. Though he was martyred we are blessed by his work that remains. The Bible translation was not Tyndale’s only work, he also published many commentaries and life application lessons. 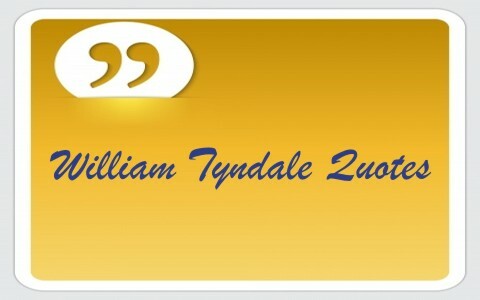 Here are just 15 eloquent William Tyndale quotes. I defy [defie] the Pope and all his laws [lawes]. If God spare my life, ere many years I will cause a boy who drives the plough to know more of the scriptures than you do. I call God to record against the day we shall appear before our Lord Jesus, that I never altered one syllable of God’s Word against my conscience, nor would do this day, if all that is in earth, whether it be honor, pleasure, or riches, might be given me. And as the circumcised in the flesh, and not in the heart, have no part in God’s good promises; even so they that be baptized in the flesh, and not in heart, have no part in Christ’s blood. There is no work better than to please God; to pour water, to wash dishes, to be a cobbler, or an apostle, all are one; to wash dishes and to preach are all one, as touching the deed, to please God. Today when we read these quotes by this fearless man we can enjoy the elegance of his Old English speech. Even better than that, we can reflect upon how God used holy men to not only record the original words of Scripture but also to translate them into our native tongue. This is a blessing that we should not take for granted. What a true hero of the faith that I can look up to and look up when I finally enter the kingdom. Thanks Pam for all you do for helping us all know much better those faithful saints of old. Trying to get my hands on the Parker Society’s 3 volume Works of William Tyndale but have read some of his treatise (5 of them) from Kindle download. There are quite a few preachers I have heard that would do well to read of Tyndale and his works in the Holy Spirit. I also have a copy of the Tyndale New Testament in the very old english and I must say makes our present copies look amateurish in translation. If one wishes to understand this little researched man of the reform period they just need to read his works. I quite agree Albert! Thanks for stopping by and sharing your thoughts. Tyndale translated only HALF of the Old Testament and all the New…you have it reversed FYI.